I’m feeling very accomplished as a wife today. Since we’ve been married I’ve struggled with Handsome Dad’s undershirts. He wears an undershirt every day, and the deodorant buildup drives me crazy. 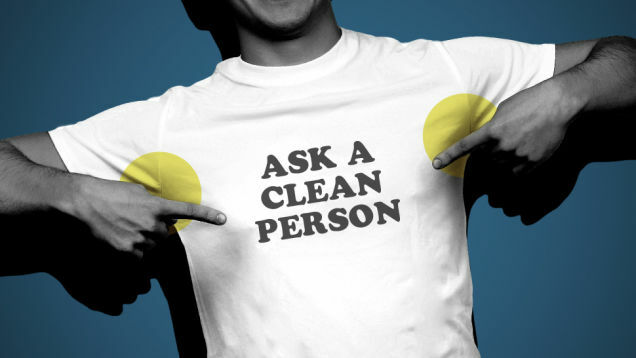 Not only are the armpits yellow, but the are hard and crusty, and the shirts themselves are waxy, almost slimy feeling. I feel ashamed when I fold his laundry and think about him wearing those shirts. If money weren’t a factor, I’d throw them all away and start over with brand new undershirts, but my husband is a bit of a brand snob and his undershirts are $15 a pop. Fill the kitchen or laundry room sink about half-way with hot water. While it’s filling add 2 tablespoons of powdered Tide and a cup of ammonia. Add the shirts. I add them one at a time and use tongs to push them down and ensure they are saturated. Let them soak for a few hours. Periodically use the tongs to agitate. After soaking, transfer to the washing machine. I use the tongs to move the shirts into a plastic pail, drain off excess water, then dump into the washer. Run the washing machine on the highest fill setting, cold wash/rinse, with no detergent, etc. You have to rinse out the ammonia so there are no dangerous vapors when you add the bleach inn the next wash cycle. After the first wash cycle, adjust the full setting to the appropriate level for the load, and set to hot wash/cold rinse. Add your favorite detergent and a cup of bleach. When the water finishes filling, turn off the machine and allow to agitate, then soak for another couple hours (this was the part I did by accident), then complete the wash cycle. When I pulled the shirts out I was so surprised I loudly exclaimed, “wow!” and Handsome Boy repeated the word over and over, his first time saying it. The old shirts were nearly indistinguishable from the newer ones! I laughed at myself over how excited I was. It truly is the little things in life that matter most. I’ll have to check the bottom of the drawer and hope there’s another old yucky shirt so I can get a before/after pic to post. Since originally writing this post I have begun doing the ammonia soak in the washer, just like the beach soak. Works great for maintenance, but if you have really bad buildup, I’d start it out in the sink for at least the first wash. Oh, and I still haven’t taken any pics – if you try it, send me your before and afters and I’ll post them!